Have you driven a pure electric car before? Most people had but they just do not realize it. If you are a golfer, most probably you have driven an electric golf cart in the golf course. The golf cart is exactly how an electric vehicle (EV) feels like. It is quiet, no vibration, no exhaust gas and has a very powerful acceleration. Many vehicle owners like the idea of using a pure plug-in electric car for their daily driving. However, a brand new electric car from the car manufacturer is still quite expensive. Let’s take the Phoenix SUT as an example. Phoenix SUT is a pickup truck that runs purely on electricity. If you want one, be prepared to spend upwards of $45,000! Yup, pure electric cars are not cheap. Due to the high cost, many people are turning into Do It Yourself (DIY) electric car conversion project to get hold of an EV. But before you rush to your garage and start yanking out the internal combustion engine of your car, this is what you have to know about homemade electric cars. Will the DIY electric car fulfill your driving needs? No doubt a DIY electric vehicle has many advantages, but it is not meant for everybody. The biggest drawback for an EV is the driving range before it has to be recharged. Do you know how many miles you drive in a day? This number is very important because it will tell you if the electric car is suitable for you. Let’s take the Phoenix SUT as an example again. The electric truck uses a lithium-titanate battery bank which give it approximately 130 miles of driving before it has to be recharged. For a DIY electric car, the type of battery you will be using is the deep cycle kind. Deep cycle batteries are used for homemade electric cars because it is most suitable and cheapest. However, EV using deep cycle batteries would not be able to give you the same driving mileage as a car using lithium-titanate batteries. Hence, your Do It Yourself electric vehicle will only have a driving mileage of approximately 50 miles before it has to be recharged. Now, do you see why your daily driving mileage is so important now? The mileage of 50 miles an EV can give you is for round trip. It is actually good if you are driving to a distant of about 25 miles from your home. The battery will provide you sufficient power to get to your destination about 25 miles away, but the balance power for the next 25 miles is needed for you to drive back. If you were to get your journey mileage wrong, you may end up having your DIY electric car stranded in the middle of the road because the battery bank runs out of juice. Before you get started on a DIY electric car project, you must know whether the EV will meet your daily driving needs. If it does, the next step is to get a good EV conversion guide. If you are looking for an electric can retrofitting guide, check out the Convert2EV e-book by Les Oke. Les Oke and his family are from Canada and have been living a green lifestyle for more than 15 years. To keep their carbon footprint low, they use pure electric cars to commute. Throughout the years, Les has converted numerous conventional automobiles to run only on electricity. 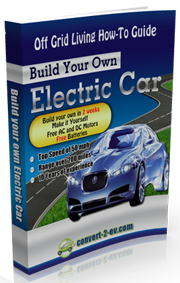 The Convert2EV guide is written based on his experience with DIY electric car conversion project. For more information on the Les’ EV guide, read the Convert2EV review on this blog. I am just wondering how praticlal is the electric truck. Can you really use it to haul heavy load? An electric powered trunk may not be as practical as a conventional truck due to its limited driving range before the batteries has to be recharge. Nonetheless, if you using is for short distance, it will save you a lot of gas money.